The floodgates have opened for me in the last two days and all because of DNA. Yesterday it was all about my Norton family from Great Yarmouth, England. A person emailed me, yes you read that right, they contacted me! Our trees didn’t jive though because I had an error in mine. I had the wrong marriage for Jeremiah Norton, I had wrongly attributed an Elizabeth Jillings as his wife. They had found the correct marriage, Elizabeth Sharpe was the wife’s name. Yes, I made one of the worst genealogy mistakes…grab and go. <sheepishly hanging head> How do I know their tree is the right one? Because I wasn’t certain of Jeremiah and Elizabeth Jillings and to be honest I hadn’t done my due diligence on that marriage record. I meant to go back and research this couple but instead, I added it to my tree and I didn’t go back. My new DNA cousin was a descendant of Elizabeth Sharp and her first husband Charles Wright. Elizabeth married a second time to Jeremiah Norton. We have five Norton descendants who show up as a match to three people who descend from the Sharpe – Wright marriage. So a lesson well learned all because of DNA. Today was going to be all about gathering data and correct records on the Norton family until an email arrived and I think I may be in genealogy heaven. This person contacted me because we were DNA matches and they could see the surname Loftus on my online tree. The second match is with — get this — Mary Loftus who I blogged about yesterday! Mary is an elusive ancestor I have been researching with a cousin Dani Lee McGowan and we have been stuck. This DNA cousin is matching with about seven people who we have identified as descendants of Mary Loftus’ two marriages. Our new DNA cousin has her Loftus family back to 1824 in Mayo, Ireland and has a tree that Mary would fit very well into. At the moment I am working with both matches to see what more can be learned! I know people who have been working on their trees for a number of years can relate to what this feels like – is euphoria the right word? A discovery like this happens maybe once a year for me if I am lucky, but to have two in two days is THE best kind of overwhelming! With all the new matches that are bound to be on the horizon keep the floodgates open and try to keep up! Jeremiah Norton was a carpenter on various ships throughout his career. Jeremiah was born in Great Yarmouth on the 29th of August in 1781, he stood a modest 5’4″ and set sail in 1805 at the age of 24 years. An anchor and a half moon tattoo was proudly displayed on his left hand. When he first went to sea he was already married, to Elizabeth Jillings, in Great Yarmouth at St. Nicholas Church (image of the Church in 1848). I was able to locate baptisms for five of his children, Mary Ann, Lee Thomas, Richard Lee, Martha and Edward from the years 1811-1825. During this time I assume he was often away on his sea voyages. With help, I have located seven of the ships he sailed on; Agenoria, Medora, Elizabeth, Cygnet, Campbell, Lang and his final ship was the Norma in 1846. The majority of the destinations of these ships were Jamaica, but the Cygnet took Jeremiah to Quebec in 1838. Jeremiah and his family eventually left Yarmouth and relocated to Shadwell, near London. Jeremiah died at sea on the Norma when he was 65 years young and left a love of shipping to his sons. Edward went to sea when he was 14, Lee Thomas/Thomas Lee in 1831 and Richard worked on ships in Quebec where he resided. My connection to the Brock family was not an obvious one. It all started with a four-page letter written by a niece to her uncle in 1883. This letter must have been important as it was passed down through my family until I rediscovered it in 1993, one hundred and ten years after it was written. I often would stop by and visit my dad, completely take over his living room by dragging out bins of long since stored away papers, photos, and paraphernalia. Hours were spent going through the piles, learning all I could from disinterested family members. I remember first discovering the letter, unfolding it, reading the names for the first time. The questions it raised were not answered. Eventually, the bins were handed off to me and I could peruse them at my leisure, which I did. At home, I would sit on my slow dial-up internet connection searching the few genealogical sites that were available and slowly the Brock family story started to unfold. 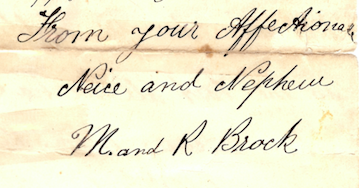 The letter was addressed to “Dear Uncle and Aunt” and signed M and R Brock revealed a few names, places and thankfully it was dated Dec. 14, 1883. The two locations mentioned were 93 Glenarm Road, Clapton and an Aunt still living in Great Yarmouth. A later discovery revealed that my great great great grandfather Richard Lee Norton was born in Great Yarmouth, aha! Next lead was searching the 1881 census which was on CD at my local Family History Library. The Brock family living at 93 Glenarm Road in Clapton consisted of four children as both parents were deceased as the letter had indicated. The census listed the oldest brother Richard, Martha and two younger brothers, Edward, and Henry. Further digging led me to the connection, the children’s mother Martha (Norton) Brock was my three times great grandfather’s sister, both born in Great Yarmouth. Richard Brock’s birth registration. Mother listed as Martha (Norton) Brock. The letter, written two years after the census was to their Uncle Richard. The four had been on their own since their father passed away and appear to have stayed in close contact with him. Robert Brock’s death registration in 1879 of bronchitis. Richard a ship captain had left England and married in Quebec City in 1854. Maybe he was sending them money to help out the expenses? The letter was informing their “Dear Uncle” of the loss of brother Henry and the problems they were having with their youngest brother Edward. Edward seems to have been a difficult sibling, Richard and Martha were having a hard time supporting him. The letter states that Edward had been out of work since the death of their father (Robert d.1879). Edward convinced his siblings he would be better off in New York and it seems they pooled their money to make this trip a reality. New York bound, he didn’t stay long it, the letter shares that he was back and when they asked why he was returning his reply, “I have altered my mind”. This leaves me wondering if he ever left, perhaps he stayed in England and blew through the money. You may wonder why I am so cynical? It was my latest discovery that makes me wonder. I have spent some time researching through Newspapers.com recently when I realized they also cover English newspapers. I went through the list of relatives that hailed from England, I typed in Richard Brock and came across more information on Edward and his exploits. I have transcribed the news article below. 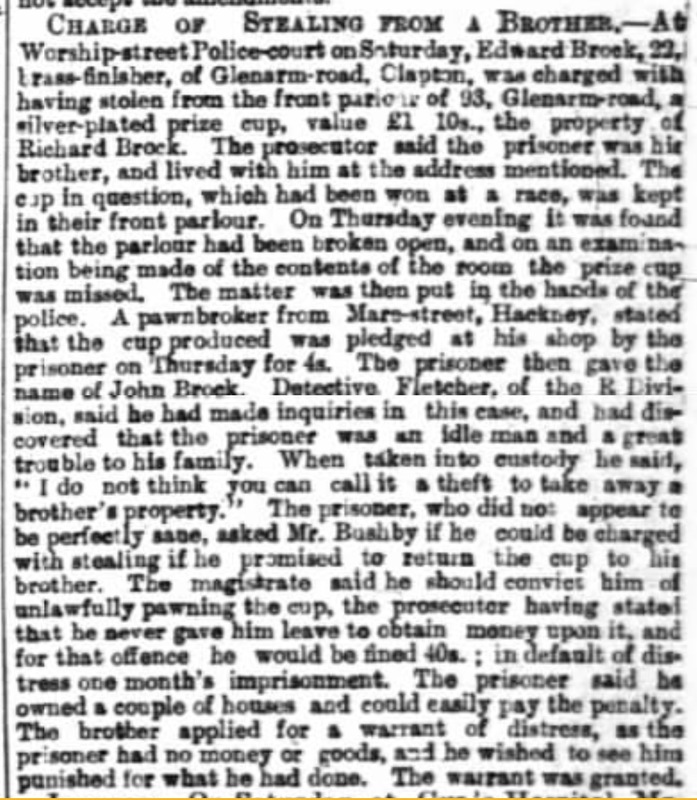 Worship-street Police-court on Saturday, Edward Brock, 22, brass-finisher, of Glenarm-road, Clapton, was charged with having stolen from the front parlour of 93, Glenarm road, a silver-plated prize cup, value £1 10s., the property of Richard Brock. The prosecutor said the prisoner was his brother and lived with him at the address mentioned. The cup in question, which had been won at a race, was kept in their front parlour. On Thursday evening it was found that the parlour had been broken open, and on an examination being made of the contents of the room the prize cup was missed. The matter was then put in the hands of the police. A pawnbroker from Mare-street, Hackney stated that the cup produced was pledged at his shop by the prisoner on Thursday for 4s. The prisoner then gave the name of John Brock. Detective Fletcher, of the R Division, said he had made inquiries in this case, and had discovered that the prisoner was an idle man and a great trouble to his family. When taken into custody he said, “I do no think you can call it a theft to take away a brother’s property.” The prisoner, who did not appear to be perfectly sane, asked Mr. Bushby if he could be charged with stealing if he promised to return the cup to his brother. The magistrate said he should convict him of unlawfully pawning the cup, the prosecutor having stated that he never gave him leave to obtain money upon it, and for that offence he would be fined 40s ; in default of distress one month’s imprisonment. The prisoner said he owned a couple of houses and could easily pay the penalty. The brother applied for a warrant of distress, as the prisoner had no money or goods, and he wished to see him punished for what he had done. The warrant was granted. The news clipping predates the letter I had found by about 4 months. It tells me the siblings were doing all the could to help their brother but as I have learned, people need to help themselves. If Edward was going to make a change in North America wouldn’t he want to come to Canada and seek help from his Uncle? That is why I question if he made the trip at all. I have followed Richard Brock through the censuses, he raised his family at the same address in Hackney. I have yet to learn what happened to Edward but I can only hope he made a change. Then again I have to think it is because of Edward that I know a little more about the Brock family in Hackney.